This lake is located in the south-eastern highlands of Ngorongoro and the surrounding region is the home of the Hadzabe bushmen, an interesting ethnic group and the last survivors of a civilization that knows nothing of agriculture, livestock, pottery, and metals. They live by hunting with bows and arrows, and gathering wild berries and fruits. They are the last heirs of the homines sapientes who took their first steps right here, along the Rift Valley, about two hundred thousand years ago. Their way of life has remained unchanged over the millennia and they live in small wandering groups of about twenty individuals. 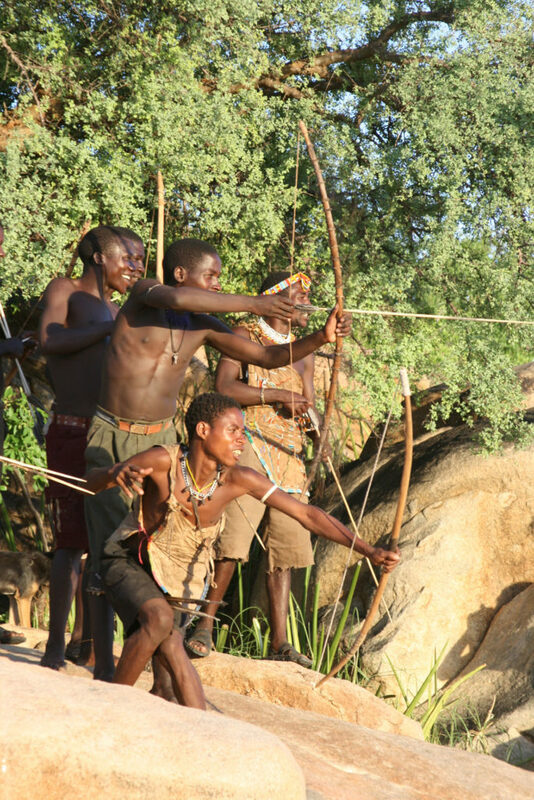 Meeting them is fascinating and they are happy to take you with them in the early morning, to hunt for a few hours and experience their archaic way of life. This is an authentic experience and is not faked or staged for tourist purposes. Other inhabitants of the region are the polygamous Datoga, herders who came from the Horn of Africa to this region following stock in search of pasture. It is possible to visit a village and a blacksmith’s shop that still uses ancient techniques to produce everyday objects, jewellery, and arrowheads for the neighbouring Hadzabe, who provide animal skins and wild honey in return. Only a few visitors who take a safari through Tanzania visit this region, but those who do are enthusiastic on their return.